When people think of cliques, they often assume that they are comprised of the popular kids at school. But cliques exist on every level of the social ladder. And sometimes the most controlling and destructive cliques are the ones that are not on anyone’s radar. To outsiders, the group looks like a cross section of friends that enjoy time together. But there are some telltale signs of cliques. For instance, cliques discourage outside friendships, thrive on one person being the decision maker and are wrought with peer pressure. They also consist of unhealthy friendships and pose some serious dangers to teens. Here are the top five dangers of cliques. When kids are in a clique, they usually do not socialize outside of their group. They do everything together. From eating lunch together to attending social events, these kids are inseparable. And rarely will they invite someone new to spend time with them. To some people, the group appears like a close-knit group of friends. They have similar interests and enjoy spending time together. The problems arise when others are not welcome to join or hang out with the group. What’s more, in cliques it is often frowned upon for a member of the group to have friends in other groups. The expectation is that to belong to the group, friendships are exclusive to the group. If someone in the group does stray from the group, they are quickly ostracized. This excessive togetherness is bad for teens because they are not meeting new people or expanding their sphere of friendships. Remember, the healthiest kids have friends in different social circles with a variety of different interests. Never encourage your kids to stick with only one group of friends, but instead encourage them to branch out and meet new people. It is almost unheard of for a clique to exist without some type of peer pressure. From pressures to exclude others and dress a certain way, to pressures to date only certain people, teens in cliques are pressured to be and act a certain way in order to belong. Even more extreme pressures like binge drinking or maintaining a certain weight, are prevalent in cliques. If you find that your child feels pressured to behave in a certain way in order to be accepted by her friends, then you need to take a closer look at whom she is hanging out with. Remember, controlling and unhealthy friends are not able to accept the fact that members of the group might have different thoughts, ideas or preferences. If your child’s friends do not appreciate her for who she is, then they are not healthy friends. There is power in numbers, and when teens belong to cliques they feel empowered to do things they would not otherwise do. As a result, they are more likely to engage in rumors and gossip as well as name-calling. They also are more likely to make fun of other people and bully those who do not fit with the ideals of their group. 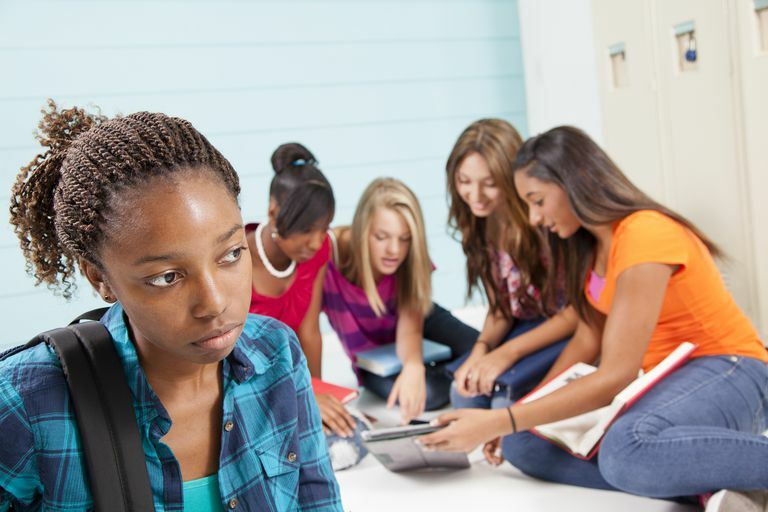 Cliques also can lead to cyberbullying. Teens in the group assume their friends have their back and will engage in cyberbullying others more freely. Meanwhile, members of their group often "like," "favorite" and "share" their mean posts and it increases their status in the group. When teens belong to cliques, there is very little chance that there are any true friendships in the group. Usually, group members are more concerned about maintaining their status in the group than they are about truly getting to know someone. They obsess over who is mad at whom and who invited whom to the latest social event. What’s more, teens in cliques are often too busy managing the dynamics of the group to really share who they really are with others. Most of their time and energy is spent on following the group's rules and people pleasing. If your child is a member of the clique, it will hinder her self-discovery and impact her self-esteem. Although it may appear comforting for your child to hang out with the same kids all the time, it can create problems over time especially if the group evolves into a clique. If you notice that your child seems more anxious or unsure of herself, or you find that she questions where she stands with her friends, you need to pay attention. Cliques damage a person’s sense of identity. No longer will your teen have a clear understanding of her likes and dislikes but instead will just go along with the group. She may even struggle with her moral compass as the pressure to belong increases. Be sure you are encouraging your teen to broaden her circle of friends. While it is wonderful to have a few close friends, it can be dangerous too, especially if one or more friends in the group like to dominate or control the decisions. Remember, the best friendships are those that are accepting of who your teen is without trying to change her or control her.